To Home Page A Bride From UkraineYou are welcome! This world would be nothing without a women or a girl! You all, Gentlemen, agree with this sentence since you are here to find your special one, your one and only, a woman who will complete your world to perfection! 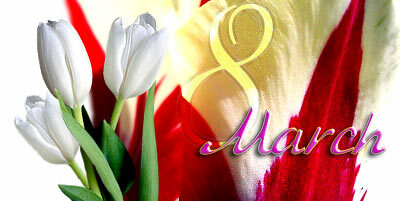 And we invite you to celebrate the 8th of March, WOMAN'S DAY and send your best wishes to the women you like! They will certainly appreciate your thoughtfulness! Read about our special offers prepared for you this week before Woman's Day! Read letters of introduction in your Inbox for 0.01 of a POINT, which is TWENTY FIVE TIMES CHEAPER than usually. You will see the mark that shows the cost of the FIRST letter 0.01 POINTs when the action begins. for 0.40 of a POINT instead of a usual 0.90! Do not forget to check the costs before you open the letter! Our web-site offers you to order gifts for your ladies with 50% discount on delivery! Ordering gifts between 2nd and 8th of March 2019 you pay only 2 POINTs for delivery (instead of the usual 3), and get FREE photo on delivery (which usually costs 1 POINT)! Do not forget that you can always choose desirable date for delivery of your gift! From the 2nd till 8th of March you will get BONUSES with your payments. Buy 8 POINTs and get 2 additional to your account! Buy 4 POINTs and get 1 additional to your account! NOTE: Bonuses are added ONLY when you buy mentioned amount of POINTs. If you buy any other amount of POINTs, no bonuses will be added. Pleasant surprise for those who want to help their ladies to learn English! Order Easy English audio course for 5 POINTs!